U.N. Ambassador Susan Rice may get the last laugh. Republicans won't be able to stop her from claiming her consolation prize, which, if a new report proves to be accurate, will be as the head of national security. Rice was supposed to be Secretary of State, but controversy surrounding comments she gave during several Sunday talk shows a few days after the September 11 attacks in Benghazi, Libya derailed those plans. 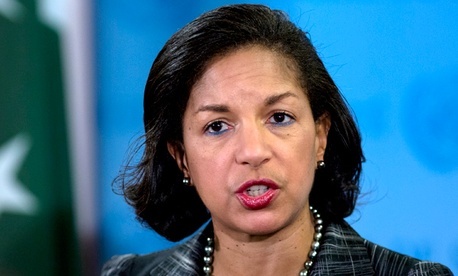 Republicans screamed unendingly about how Rice was a liar, a trickster and about two steps short of being Darth Vader. To put it lightly, they dragged her through the mud. She dropped out, and Obama settled on John Kerry, but maybe not necessarily in that order. No one said a word after that. Rice even joked about the whole ordeal with Jon Stewart. But the White House apparently still wants to put her in a new position focusing on foreign policy. A rather big one, in fact. The Washington Post's Colum Lynch reports Rice is "far and away" the leading candidate to replace Thomas Donilon as the White House National Security Advisor later this year. The move wouldn't occur until the U.S. takes their turn as president of the U.N. Security Council in July, though. Rice will be pleased to know there's no Senate confirmation hearing required for the national security position, so her usual critics John McCain and Lindsey Graham can crow as much as they want to no avail.